Yesterday was one the best days we've ever had here at Levrets Ink. It was a day of making new friends, laughter, screen printing, and putting our mission and values as a company into action for our community. We had our first (and hopefully not our last) field trip day here at Levrets Ink. We had 20 families (that's over 80 people!) come to our shop throughout the day yesterday to learn all about screen printing and the creative process that goes into the creation of a t-shirt. We were able to create, inspire, and unite. Broc, our Art Director, explaining different types of inks used by screen printers. We went through the entire process that goes into creating a shirt for a client. We began with a brief introduction to the history of Levrets Ink and a couple of the different processes of screen printing. Then, each group got to see how artwork is created and our own creative process for taking a design from a small sketch book to an awesome shirt. The best experience of this stage of the field trip for each family was seeing the young artist's eyes light up at the possibility of their creation being put into production. We always do our best to highlight the importance in all of our lives to never stop creating. Broc shows the steps to his creative process of creating artwork. We then moved into the shop, where the real magic happens. Like most days, we stay blessed here at Levrets Ink and our printers yesterday had several tall orders to complete. This meant that each family throughout the day got to see our printers hard at work. It's always exciting to walk into a print shop for the first time and hear the new sounds of presses hissing and clanking. 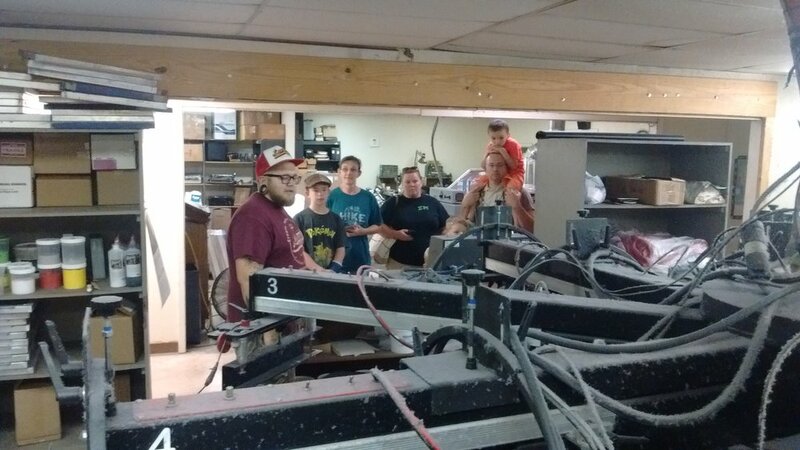 Each family got to meet our print crew and see the behind the scenes of a screen printing shop. Most kids even got to see their first dark room and how screens are made. 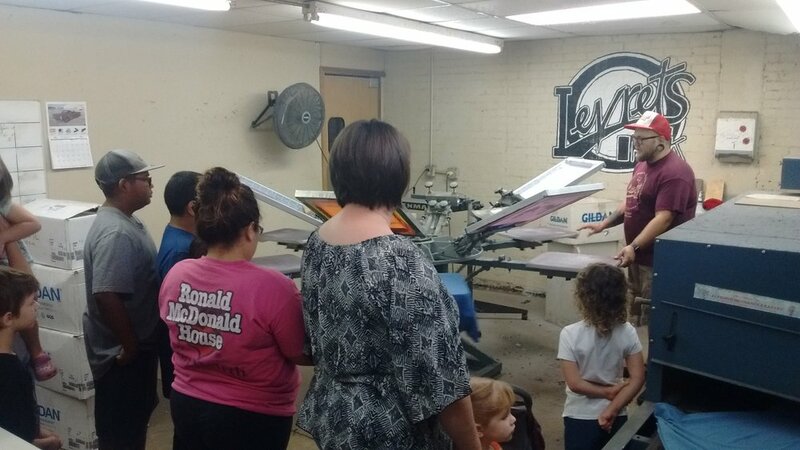 We had kids and adults from every age and background come through our shop and experience screen printing first hand. Most of them for their very first time. At the end of each tour, everyone got the opportunity to print their very own shirt on one of our manual presses. This part was super fun. At the end, everyone put on their fresh new shirt they made and we took a picture out front. Not a normal day here at the shop, but one we will not soon forget either! We would like to extend a very special thank you to Vivi for reaching out to us and getting everything organized. We try to do things a little differently around here and we always strive to give back to our community in any way we can. We love Abilene, we love making new friends, but most importantly we love to create alongside new and old friends, to inspire those around us to pursue what they love and try new things, and to unite our community in any way possible. Everyone with their fresh new shirt they hand printed.